What is it? 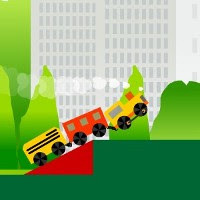 – Mini Train is a tranquil physics-based puzzle game where you need to use shapes to bridge gaps and circumvent obstacles so that your tiny train can make it to safety. Who made it? – The game was developed by Peter Kaspar Mmix. How does it play? – Using the mouse to manipulate the various shapes you’re presented with for a given level, your job is to create a safe route for the miniature train. Gravity and physics are both your best friends and your worst enemies, and though things begin fairly easy, some of the later levels will likely test your coordination and basic engineering skills – especially the ones with a lot of shapes to contend with. Truth be told, Mini Train is like a simplified version of the excellent game Cargo Bridge, combined with the physics and shape management of games like Super Stacker 2 or Jelly Towers. Presentation – The game sports very cute and clean graphics, highlighted by vibrant colors. The in-game music is a quality ragtime-esque jingle, though listening to it in a constant loop may induce light cases of insanity. Positives – Despite the ease of the earlier levels, there are certainly some difficult puzzles in the latter half of the game’s 24 levels. The levels aren’t timed, and there’s no high-score feature, and it’s somewhat refreshing to be able to think before you act. Negatives – The slower pace may not appeal to everyone, though it suits the game well. I also found it rather frustrating that the shapes you position can upset the stationary train if they bump into each other. Due to the bouncy nature of the objects and the game’s physics, it’s a bit too easy to inadvertently send a shape careening around the screen. If a flying shape collides with the train, you’ll likely need to reset the level. Why you should play it – Mini Train is a solid and fun puzzle game, even though it doesn’t reinvent the wheel in terms of gameplay or presentation. It’s also not the most difficult game in the world, though some levels will pose a challenge. If you’re a fan of physics-based puzzles, there are a lot worse ways to kill some of your afternoon.